I love all potions, lotions, and concoctions sold to us girlies, but my favorite potion is perfume. But, there is a big but here, and I am not referring to mine; is the fact that some commercial scents are variations on the same theme, and it is ever increasingly more difficult to differentiate between one from the other. An example of this is Dior’s famous fragrance Poison, there is now Hypnotic Poison, Pure Poison, Midnight Poison. I mean how many poisons do you need? And this is just one example, there are many others. So what is a fussy girl to do who wants to smell as sweet as a flower, but not like every other flower in the garden? Well, the answer lies in finding different things as one travels. France used to be one of my favorite places for hunting down scents, but now with the internet, I can just order most of them online, this of course never stops me from hopping on a train to Paris. There is always something to find down some little street in the city. Serge Lutens scents are magical to say the least, I discovered this little wonderful shop in the Palais Royal about 12 years ago, and have been in love ever since. 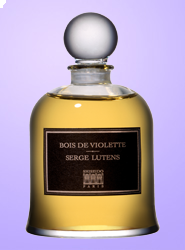 My favorites are Bois De Violette from where I took my working name. Bois Oriental and my third favorite, La Myrrhe, which is like wearing the scents of an Arabian Souk, the scent is that complex. Another of my favorite perfume houses is L’Artisan Parfumeur, they do make some truly funky stuff for home and body, I started using their home fragances years ago, and just started using their personal ones this Christmas when I was given Havana Vanilla for a present. Oh it is so delicious, and the scent does change with body chemistry. Let’s say those spicy notes turn musky when a girl is hot and bothered. Last but not least, is Tom Ford, he’s doing something with fragrances that the rest of the perfume world would do well to follow, he is creating special scents, which aren’t afraid to be just that bit different. I have used Black Orchid, and White Patchouli, but the one that got me was Black Violet, from his Private Blend Collection. Oh this is heady stuff. Not for the faint of heart either, it sticks. Yummy.